I am new to this Forum, but I am multiboxing since ~4 years and didn't register since I learned everything I know learn by doing. I want to buy a new Computer since my old one seems so slow to me these days My PC can still handle multiple clients but it's time to get a new one. First of all, I want to show you what my future system will look like, but maybe you can give me some advice about what I should change etc. From experience you dont want to max the the cpu usage, but you want to play at around max 80%, so you have some spare resources, or else you will experience drop in fps and not enjoyable gameplay. Basically if you play in 1080p, front game 60 fps or so, background 25 fps (with slot swap macroes for low/main game details), you need atleast a 8700K cpu for each 10 games. If you plan/have to to play 20 games on one pc = you do the math = it has to be something pretty beefy (14 core/28 thread intel (bare minimum tbh) or something similar (ideally better) from amd threadripper: would be awesome to factor in/try 4 cores per game). And its gonna cost a bit. And you will need 64 gb ram (im using 30 gb ram on the pc that plays 10 games while visiting dalaran on peak times), atleast. The radeon 7 with 16 gb vram sounds ok to me. Ive noticed my computers play like a knife through hot butter at certain times of the day, but then always have some slowdown, almost no matter what, at some times. It seems when the servers are busy (many people online), it doesnt really matter which kind of pc you have (? ), as it will be some slowdown (old game engine limitation, i supspect). But you definitetly dont want to get any lag when the servers are top notch. Hence you will need a pc with some spare resources. What kind of budget are we talking about here? (the cpu will cost maybe around 2k dollars, if you have to play on a single pc).. depending on where you live and the what the prices are. Try calculate the best cpu you can afford, motherboard and an additiononal 32 gb ram (try get a motherboard that have space for up to 128 gb ram, just in case) = ballpark figure to box up to 20 accounts. From my experience WoW still puts a huge load on one or two cores. Graphic quality is one such weirdo with the game engine. Set view distance to 1 and you see a noticeable relief on core 0 and 1 but the GPU doesn't budge. To me this represents that the CPU is actually rendering a lot of assets in the world. Renderscale is another. Renderscale 1 or 0.05 has about 10% utilization difference on the GPU. I'm honestly not sure what role the GPU has in rendering WoW frames these days but I'm fairly sure asset loading is something on the CPU. Maybe the GPU is tasked with various jobs like shading, shadows, lightbeams and such effects like portals but all models are CPU. Currently I'm on an older system. I 5 box presently. I'm also thinking about a TR build but I am being super cautious. With the release later this year and the potential impact on WoW. Basically I don't want to spend 3k USD and find out my gains are meager. Besides I get close to 50FPS in the capital city if I set slot 1 to view distance 1 and the slaves to 1 quality / 0.05 renderscale. So simple adjustments are making 5 boxing pretty manageable already. Still thinking about that 10 man build though. Note1: RenderScale test was done with a View Distance setting of 8. Note2: When testing with DX11 Legacy, results were very similar, except more CPU, overall, was used. Note3: Results will likely vary depending on where you're testing. Interesting. That's a pretty big chunk out of the GPU. I suspect your view distance might have been the reason. Can you try with view distance at 1? Thanks! Also I am using DX11 Legacy still. I switched to DX12 and ran just one client. Here is what I saw. My GPU never got over 50% utilization. I flipped view distance between 1 and 8, tried changing the renderscale, nothing. CPU constantly went to 90% once I was in VoS. So then I did two things. I kept 1 slot online and the other 4 offline / exited app. I then bumped the allowable FPS in isboxer for slot 1 to 200. Then I bumped the quality slider to 10 (ultra). I gave slot 1 access to all the machine cores. Interestingly the CPU remained 90% in VoS, the GPU around 40-45%. This didn't make sense to me. 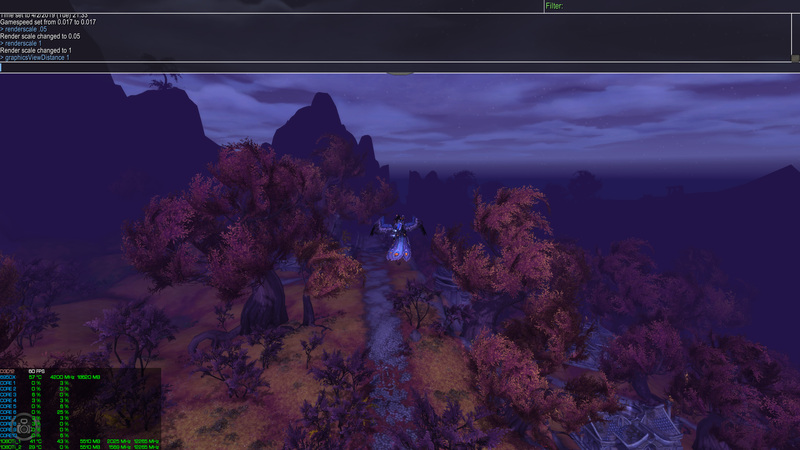 So I left VoS (just flew away to the outskirts of Ogrimmar towards Azshara). Now this is interesting. The CPU was no longer bogged to 90% and my FPS were climbing. GPU now went from 40-45% utilization to 70%! I am firmly of the belief now that my CPU is bottlenecking my GPU. That the CPU role in rendering assets and probably some other calculations is bottlenecking the work of the GPU. 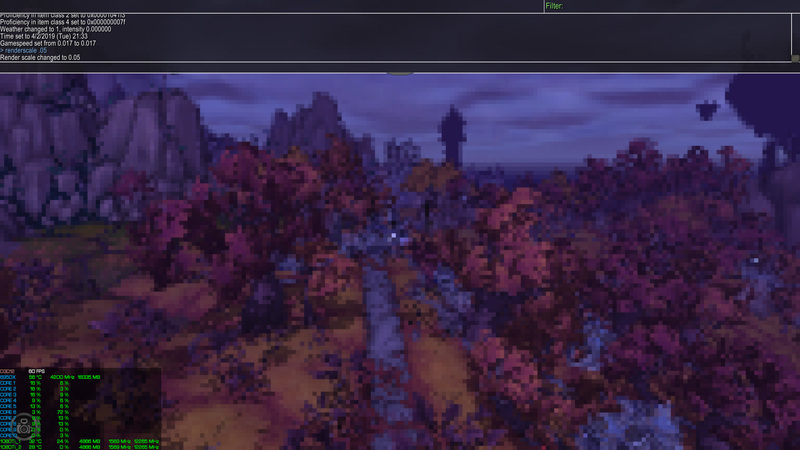 If the GPU only has to render 30 frames in a place like VoS then it never gets above 50% usually hovering around 40%. Last edited by MadMilitia : 04-03-2019 at 01:12 PM Reason: More details. Using DX11 Legacy and a VD of 1, I see a drop from ~44% to ~11% in GPU usage when changing Render Scale from 1 to .05. The same occurred in DX12, but, again, CPU usage is different between the two APIs. That's entirely possible, and it's my bottleneck while playing solo and using DX11 Legacy mode, but I've got a 10C/20T 6950X and I play at 4K (or near that when multiboxing x5). Definitely seems you're less CPU bound and so your GPU is being worked harder than mine. This is promising for a TR 10 account build with renderscale of 5% for followers. Also even when I gave slot 1 access to all cores, predictably not all of them were fully utilized. Just one or two at a time hit max utilization. Which probably means the model renderer is CPU bound and is limited in the number of cores it leverages. The game is limited to about 2-3 cores or 4-6 threads, but the multi-threaded DX12 improvements that 8.1.5 included, help alleviate that. DX12 obviously comes with its own drawback of using a large amount of VRAM, which is why we've been telling a lot of people to steer clear of it, since, I think, most people would find themselves hitting that ceiling unless they have a large amount of VRAM on their GPU. For sure, I think pre-8.1.5 the core utilization on my last test would have been something like 80 one core and 0-5% on the others. Now with DX12 and 8.1.5 I see a more distributed usage across most of the cores BUT one core is still hitting 80+ at times in heavy asset areas like VoS.